Happy due date Charlotte! (March 11, 2015). Time flies when you are in love and sleep deprived! Our little girl has been here for 2 whole weeks and we have already reached her due date. Oh the things we have learned in those 2 weeks! Charlotte is gaining weight SO well and has entered a growth spurt too! That requires me to feed her pretty much all night long, but if it keeps my baby growing I'm going to do it! I'm really surprised that I'm handling the sleep difference so well, as I LOVE my sleep. However, it doesn't take much to nurse a baby and put them back to sleep, and I'm great at drifting right back to sleep once she is snug in her bed, so it hasn't been too bad. Plus we sleep from about midnight to noon (complete with several interruptions of course) so I get several good hours in there. I have to admit that I do not mind the laying around the house all day in my pajamas part of having a newborn. It's going to be so hard to get back to work! I'm actually working a little each day to keep up with my case load and so I don't leave any clients waiting for too long. It actually makes me feel really productive to work a little each day and hopefully will make the transition back to the office go smoother. --The dogs going into attack mode and barking at any moving thing that comes our way doesn't phase her or even wake her. I hope this is because she is used to hearing them from when she was inside me. And while we are discussing the dogs, they have not been allowed in our room since they came home to meet Charlotte. This was hardest on Ruffles because she is used to sleeping in bed with me but for cleanliness sake they have been banned for a while. They have the run of the rest of the house so they are fine but a little confused. The cats stay in the basement because I'm afraid they will jump on her by accident. --She had her first real bath last night (3/10) and was not a giant fan. I think she was cold. However it didn't last long because she went tt in the water so we just went back to a sink bath. She LOVES to put her toes in the warm water! 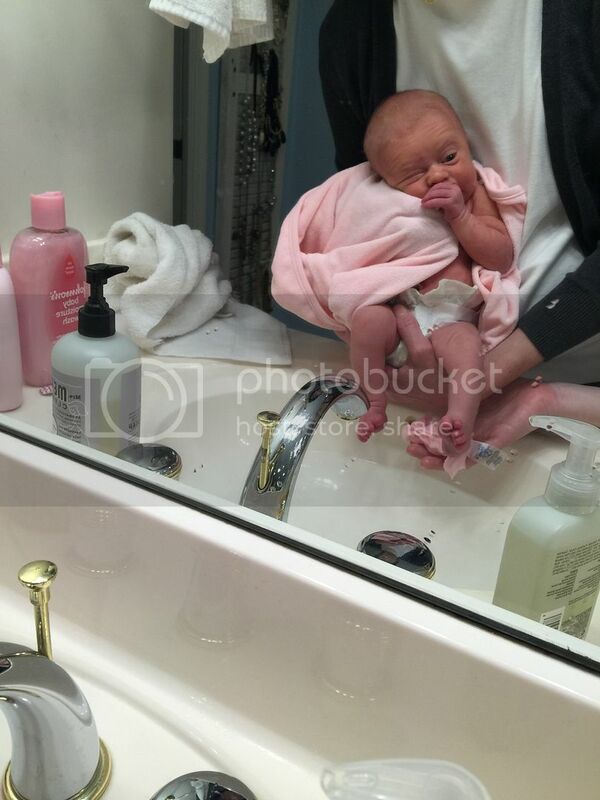 This was her first sink bath at home. --She loves riding in her Mom a Roo! She just stares at the little mobile at the top too. --She also loves light--probably that's pretty much all she can see. If we turn on a lamp she will gaze at it and I always put her in her Mom a Roo by the window so she can look at the light coming in through the blinds. --She listens when we talk and will turn her head to voices. It's funny to watch her when I'm on face time with someone because she is not sure where to look to find the voice. --She finally has let me start dressing her! For the first nearly 2 weeks of her life she exclusively sported a diaper, hospital t shirt, hospital cap, and was swaddled in a hospital blanker. She now has decided she doesn't need or want to be swaddled which necessitated putting real clothes on her so she doesn't freeze and she has made her peace with it. Her uniform for the first couple of days. 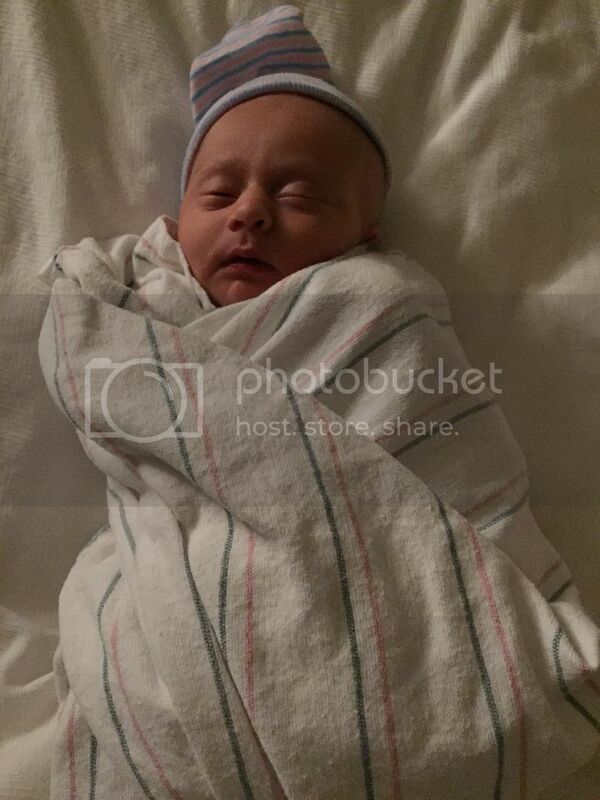 --We have been feeding her every 3 hours like clockwork since she was born. However, she decided this week to rebel and do it her way. We had 2 terrible nights and then I just gave up on 3 hours to see what she would do. Well, she woke herself up to eat every 2 to 2 1/2 hours--hooray! No more alarm clocks!! --We have been weighing her on a kitchen scale every day to make sure she is still gaining weight, and she REALLY is!